Fade-resistant permanent marker. Bullet nib for fine marking. Comfortable rubber grip. White barrel only. Grip and clip match colour of ink.. description_additional : Marker: Black, Blue. 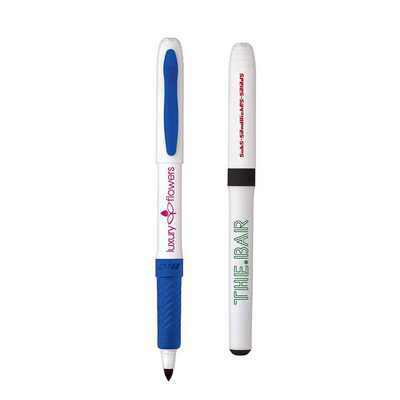 product_features : Fade-resistant permanent marker. Bullet nib for fine marking. Comfortable rubber grip. White barrel only. Grip and clip match colour of ink.. product_materials : Plastic. product_item_size : 16mm (W) x 140mm (H). product_packaging_inner : Bulk. colours_available_appa : Black|Blue. decoration_options_available : Screen Print (SP). decoration_areas : Screen Print (SP): Barrel: 40mm(W) x 20mm(H) max 1 Colours. CAP: 30mm(W) x 10mm(H) max 2 Colours. Price Includes : Plastic Pens.